Needs a lot of T.L.C has had a of of work done but much more to go. Considering cold molding below waterline where planking has been removed. Any comments on this would be helpful and welcomed. I used cold molding to replace the bottom of my 1960 Mason mahogany lapstrake. 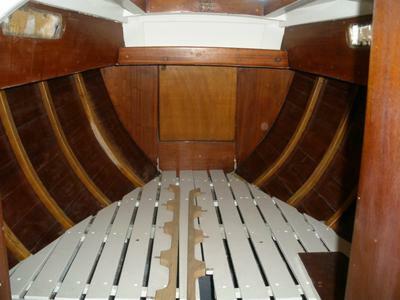 I removed the old plywood strips, sistered or replaced the ribs from the waterline to the keel and rebuilt the bottom using three layers of 1/8 mahogany marine plywood. 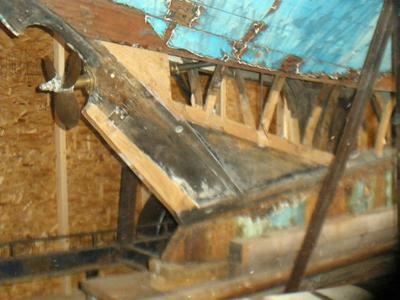 The first ply was bonded to the ribs and subsequent plys were bonded to the previous layer. The original bottom was 3/8 ply so the thickness was the same but the construction turned out to be enormously more rigid. I was a bit worried that the new rigid hull would put stress on the ribs where the new bottom met the old lapstrakes so I filleted the joins of the lapstrakes to make the topsides more rigid. I have been using the boat for about 10 years now and am very pleased with the result. 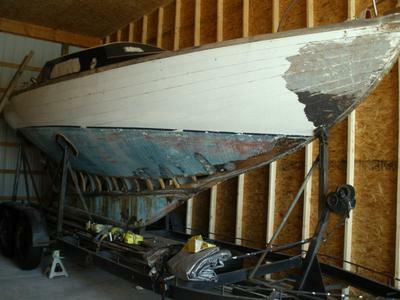 I realized repairing this boat was beyond my talents and decided to sell. Thanks to all who commented and gave me advice along the way. Charles Thanks for the Link. That method is kind of of what I was thinking about doing, But all information I have gathered strongly suggests NOT doing it that way,Including this site! Apparently the planking can move and will break the bond between the wood planking and the cloth/epoxy. I would rather do this method rather than the cotton and putty. Maybe others can chime in with their opinions, And experience. As of now I have done nothing, Except consider making a bar out of the boat. I probably get more use out of it that way anyway. I'd have to agree that replanking and epoxy sounds a lot easier. I am renovating a 1957, P-28 which had a lot of hull problems. It was a bit of work but is looking pretty good now. Best of luck with your P-28. I’m sure it could be done, Don. 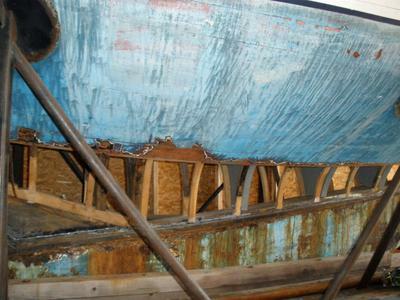 But how would you treat the joint between the cold molded section and the original planks? I can’t help thinking that just replacing the planks would be a simpler job. Or how about strip planking?